A woman brought her pet duck into the vet. She placed the limp duck on the examination table. The vet thoroughly examined him and said, regretfully, "I am sorry ma'am you're duck is dead." The woman cried, "no, maybe he is in a coma. I need for you to check again." The vet rolled his eyes and left the room. He returned with a dog who cautiously sniffed the duck and shook his head. 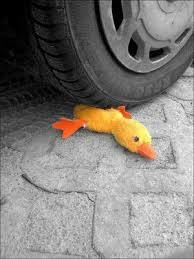 The vet exclaimed again, "I am sorry your duck is dead." "No," the woman cried. "He can't be. Check again." The vet left and returned with a cat who sniffed the duck and shook his head. The woman finally accepted this and the vet brought her the bill. "What? $150 for a dead duck?!!!" The vet replied, "It would have just cost you $50 had you taken my diagnosis but the lab report and the CAT scan were EXTRA.!! !